All running shoes are not created equal. Not only can they alter your speed, but they can also affect your knees, your back and your joints. Selecting the right running shoe can make all the difference, and it can be overwhelming when faced with a wall full of shoes that all look pretty much the same. But if you follow these steps, you can find shoes that will have you running like an Olympic marathoner. 1) Find a good running shoe store. You can buy your shoe at the local mega-mart, but the sales professionals in a specialty store are better trained to help you pick the right shoe. To locate a store, ask friends who run, check running magazine reviews, or check the yellow pages. 2) Examine the soles of your old running shoes. Notice the spots where the shoes show wear from the road. This tells you where your foot falls every time it hits the ground. 3) Place your shoes side-by-side on a flat surface. If the shoes tilt in toward the middle, your new shoe probably needs more stability than your old shoe. If they tilt to the outside, you may have a high arch and your new shoes should have good shock absorption. 4) Look at the top of your shoe. If you can see an outline of your big or little toe, and you've noticed discomfort in those areas while running, you should try a larger or wider shoe. 5) Go to the running shoe store and bring a pair with you. The employees should be able to help you find on the shoe based on the wear patterns discussed previously. If not, you probably should find a different store. 6) Try out the shoes. Many stores have a treadmill that you can use to audition the shoes. Try on as many shoes as it takes. Make sure you like the feel and fit of the shoe. Make sure the shoe maintains its comfort during wear. 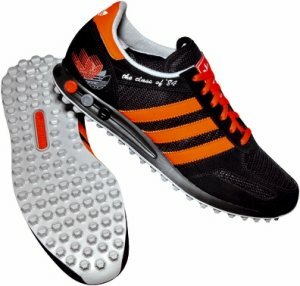 7) Be sure to replace the shoe once you have ran the recommend mileage with them. Once the shoe breaks down from wear, it no longer provides the support that it is suppose to.